Tapu Lele in game: 619 Who? Important notice! 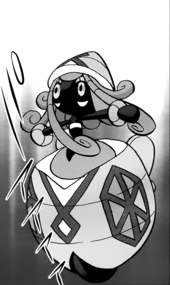 Pokemon Tapu Lele is a fictional character of humans. 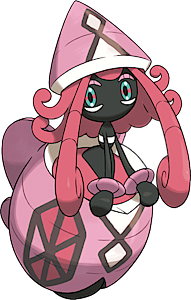 Tapu Lele (Japanese: ??·??? Kapu-Tetefu) is a dual-type Psychic/Fairy Pokémon introduced in Generation VII. It is the guardian king of Akala Island. Tapu Lele has a black torso and pink curly hair. Its eyes are blue with pink lines at the middle of the iris. Its arms are thin, and its digitless hands are separated by thick pink "bracelets". Its shell has markings similar to a face and have small, butterfly-like wings at the back. The top is cone-shaped and resembles a hat of some sort. When closed, the shell resembles a bug with a curled mouth at the bottom. The guardian of Akala Island is known to scatter glowing scales, which affect others by stimulating and healing their bodies; however, these scales are also dangerous if too many are touched at once. For this, some consider it to be cruel for the way it destroys others as it scatters its scales for its own amusement. An old legend says that Tapu Lele ended a war between Alola's islands by healing the tired warriors with its scales, but rumors point to a more disturbing truth behind this story. Its strength comes from the energy stored within its shell. If Tapu Lele finds itself at a disadvantage in battle, it will prioritize not outright losing as opposed to trying for a decisive victory. In the Sun & Moon chapter, Tapu Lele was first mentioned by Olivia, noting that there have been sightings of it around Akala Island. This guardian king of Akala is guilelessly cruel. The fragrant aroma of flowers is the source of its energy. 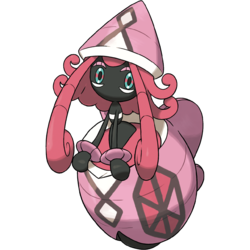 Tapu Lele appears to be based on a butterfly emerging from its chrysalis. Kapu-Tetefu may be a combination of kapu (Hawaiian for sacred or holy) and ???? tefutefu (an old way of writing butterfly).